We're so fortunate to have earned the trust of many of the largest companies in Massachusetts. 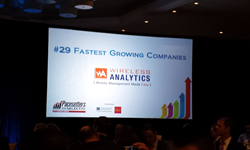 Wireless Analytics, LLC, a pioneer of outsourced wireless expense management and award-winning provider of managed enterprise mobility services, is pleased to announce that it has been ranked 29th on the Boston Business Journal’s 2014 Pacesetters, an annual list of the fastest-growing private companies in Massachusetts. The list represents 70 privately held businesses that recorded the state’s fastest revenue growth from 2010 through 2013. Rankings were announced April 17 during a breakfast event at the Westin Copley Place in Boston. “The BBJ’s annual Pacesetters list is all about the entrepreneurs and companies that make Massachusetts one of the most dynamic and innovative economies in the world,” said Chris McIntosh, publisher of the Boston Business Journal. Wireless Analytics’ recognition as one of the 2014 Pacesetters represents the latest honor for the Boston-area company. In 2013, Wireless Analytics was ranked as the 50th fastest-growing, privately held telecommunications company on Inc. Magazine’s annual Inc. 5000. Wireless Analytics has garnered past industry recognition from AOTMP, a leading industry authority on telecom performance, earning top rankings in customer satisfaction from the industry organization, and received AOTMP’s 2012 Efficiency First® Framework Supplier Award. Wireless Analytics makes wireless mobility management easy and efficient. Since 2003, Wireless Analytics has helped enterprise customers decrease spend with their carriers, reduce internal IT support costs, and enable employee productivity through mobile technology. Our CLEAN Platform™ (Communications Lifecycle Expense Analytics) empowers businesses through easy access to mobility expense reporting, wireless performance metrics, and powerful online procurement, provisioning and asset tracking tools. Wireless Analytics also partners with leading providers, such as MobileIron, Truphone, and iPass, to offer tailored solutions for enterprise mobility management. For three years running, Wireless Analytics has been ranked among the highest in customer satisfaction by AOTMP, a leading industry authority on telecom performance. In 2013, Wireless Analytics was ranked as the 50th fastest-growing, privately held company in the Telecommunications Sector by Inc. Magazine’s Inc. 500/5000, and in 2014 was recognized as the 29th fastest growing privately held company in Massachusetts as ranked by the Boston Business Journal. To learn more, please visit http://www.WirelessAnalytics.com.